Rafael, Pablo and Anselmo meet at an elders' home. Their friendship grows based on their sense of humor and will to live. Life at the home can be sad. With their typical wit, they recruit other residents, particularly three ladies nicknamed the Greeks. Together they challenge the home's rules of behavior and register into a sports contest for a juicy prize. 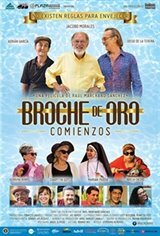 Because there are no rules for growing old, Broche de oro: Beginnings celebrates life and reminds us to live it to the fullest until the end.